There’s only one thing to do. And that’s draw attention to the name of an entirely different cricketer because it’s slightly amusing if you don’t pronounce it correctly. Bangladesh have a player called Anamul Haque. Anamul! On top of this, they also have a player called Mominul Haque who just scored 181 against New Zealand. Mominul isn’t a funny name unless you first lay the groundwork. If you do that, it starts to sound a bit like a really pissed person trying to say ‘Anamul’. We think you’ll all agree, we’re covering this Tendulkar retirement thing better than anyone. Any chance we could find a photo of Anamul being indifferent to cricket? I’ve just had an advert for iams cat food appear on here. Either my wife has been looking at animal rescue websites again, or we do actually talk about cats too much on here. That’s not necessarily an either/or. 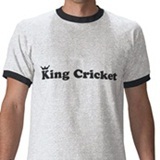 So King you’re saying since every hack in cricket is talking about Tendulkar, you’ll tell us about the Haques? I thought you were going to avoid the topic. Are there no Australians in London?